Two decades into a directing career that would continue for over three more, Alfred Hitchcock made his first American film with Rebecca (1940) alongside iconic producer David O. Selznick. Adapted from Daphne du Maurier's hugely popular novel, the story's long and ever-twisting plot follows a demure young woman (Joan Fontaine) who captures the attention of wealthy widower Maximilian "Maxim" de Winter (Laurence Olivier) during her employer's trip to Monte Carlo. 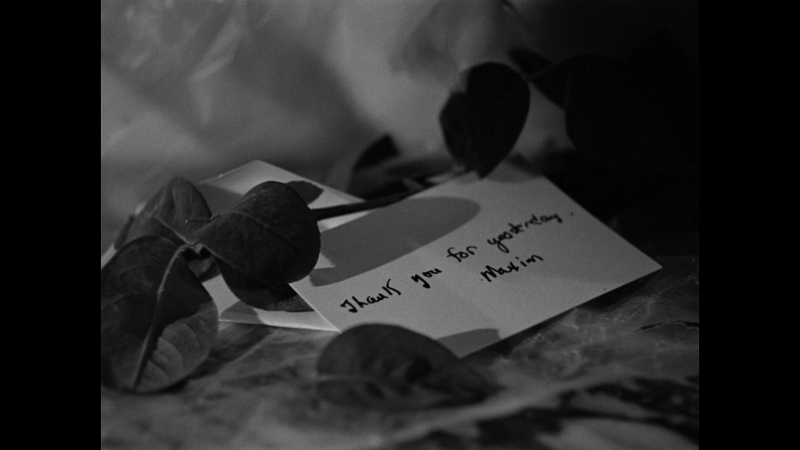 The unnamed woman (referred to only as "I" in the novel, told in first person narrative) and Maxim are married only weeks later, where they return to his picturesque Manderlay estate and meet an attentive roster of personal assistants. Some, like head housekeeper Mrs. Danvers (Judith Anderson), are not happy to see the young bride; it's revealed that Maxim's first wife Rebecca died less than a year earlier, and she was adored by almost everyone. For those unfamiliar with the novel, it's obvious that all is not what it seems during Rebecca and its haunting atmosphere paves the way for plenty of memorable visuals (thanks to outstanding set design, Oscar-winning cinematography by George Barnes, and no shortage of cleverly disguised matte paintings). Yet some of its most striking elements are implied rather than shown: from the unnamed main character played so perfectly by relative newcomer Joan Fontaine to the fact that its title character is only spoken about and never seen, there's a natural mystery that gives the film and its source novel an attractive, almost magnetic ambiguity. Luckily, the core story of Rebecca is more than interesting enough to hold our attention as some of the puzzle pieces fall into place: from the true nature of Mrs. Danvers to the revelation of Maxim and his first wife's abridged relationship, it's anything but a conventional thriller. Interviews, featurettes, essays, and other items---some of which are included on Criterion's new Blu-ray---suggest that Selznick's firm hand made Rebecca a more faithful [read: literal] interpretation of du Maurier's novel than Hitchcock most likely intended; not surprising, given the producer's track record for adaptations (including the previous year's Gone With the Wind, obviously). 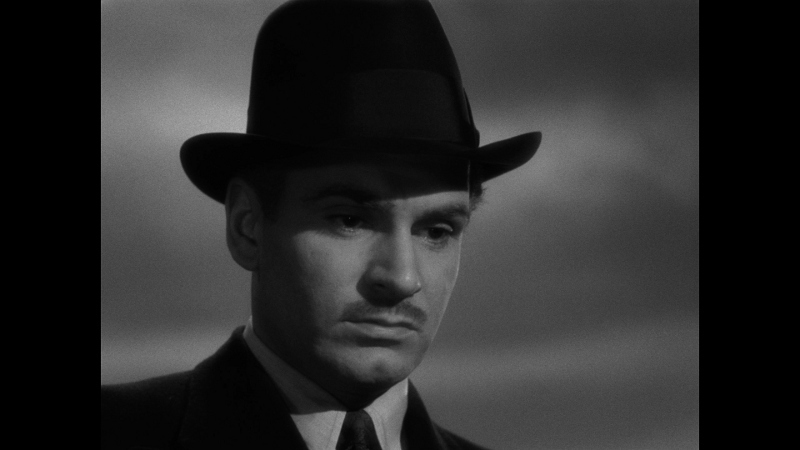 So while the end result is unquestionably a solid and engaging film that holds up more than 75 years later, newcomers expecting loads of classic Hitchcock trademarks should adjust their expectations. 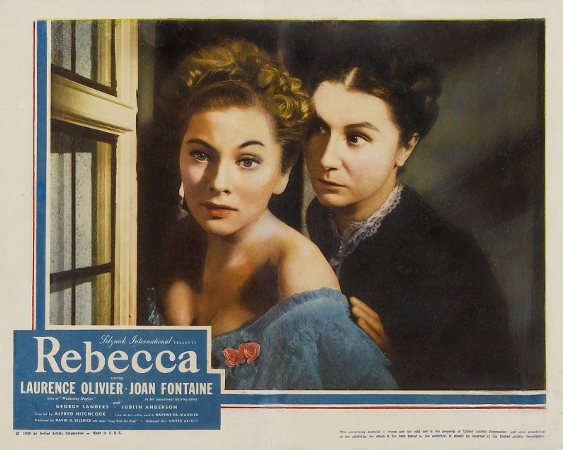 It's doesn't feel nearly as compromised as Suspicion (released the following year with a butchered ending, and also starring Fontaine opposite Cary Grant), but Rebecca still shows obvious signs of friction behind the scenes. Either way, this is a largely seamless production with top-notch cinematography, clever visual effects (many of which may go unnoticed by casual fans, and are covered in detail elsewhere on this release), and, most importantly, outstanding lead performances that hold everything together with ease. Criterion presents Rebecca on Blu-ray more than 15 years after their long out-of-print 2001 DVD and MGM's similarly out-of-print 2012 Blu-ray; as expected, it pairs a wonderful new A/V presentation with enough new and vintage bonus features to make this a two-disc release. Presented in its original 1.33:1 aspect ratio, Rebecca looks much more refined than Criterion's own 2001 DVD and the MGM Blu-ray from a few years ago; not surprising, considering this 1080p transfer is the result of a brand new 4K digital restoration. Black levels are consistent (if not a bit overwhelming at times, although this is expected on many Criterion discs), image detail and textures are quite good, and the film's light but noticeable grain structure is represented perfectly well from start to finish. Many of the film's in-camera effects and matte paintings also blend in quite seamlessly. No obvious digital imperfections or heavy manipulation (including compression artifacts, interlacing, excessive noise reduction, etc.) could be spotted along the way, either. I simply can't imagine Rebecca looking much better on home video than it does here, so die-hard fans of the film should be pleased with Criterion's efforts. There's less to say about the PCM 1.0 track (and, by extension, the Isolated Music and Effects Track), aside from that it's perfectly adequate and sounds better than expected for a film that recently passed its 75th birthday. Dialogue, Franz Waxman's score, and background effects are perfectly crisp and clear without fighting for attention, while the overall experience even manages to display a few moments of depth at times. Overall, this lossless mono presentation seems true to the source material and purists will enjoy the lack of surround gimmickry. This is honestly one of the better presentations for a film of this era that I've heard in recent memory. Optional English subtitles are included during the main feature only, along with forced subs during at least one foreign-language bonus feature. As usual, Criterion's interface is smooth and easy to navigate. This two-disc release is locked for Region A players; it's packaged in their typical "stocky" keepcase with overlapping hubs and moody cover artwork. The included Booklet is quite substantial and features notes about the new restoration, an essay by film critic and Selznick biographer David Thomson, plus selected Selznick production correspondence (including some with Hitchcock himself). Plenty of material to dig through, and Criterion has the good sense to spread it across two separate Blu-rays. The new items begin with a 2017 Conversation between critic Molly Haskell and scholar Patricia White (25 minutes), who largely discuss the film's feminist themes. Also new here is a fantastic Interview with film historian Craig Barron (17 minutes), who details Rebecca's subtle and not-so-subtle visual effects. The 2017 French TV Documentary Daphne du Maurier: In the Footsteps of "Rebecca" (55 minutes), directed by Elisabeth Aubert Schlumberger, features a handful of du Maurier's friends, contemporaries, and family members paying tribute to the late English author. Finally, two classic segments from NBC's Tomorrow round out the new supplements: one features host Tom Snyder interviewing Alfred Hitchcock in 1973 (44 minutes); the second features Snyder chatting with Joan Fontaine in 1980 (17 minutes). Several vintage extras (mostly from the 2001 Criterion DVD and MGM Blu-ray) are also on board, including a 1990 Audio Commentary with Hitchcock expert Leonard J. Leff, several Screen & Casting Tests, three separate Radio Versions of Rebecca (from 1938, 1941, and 1950), a mid-length Making-of Documentary from 2007, two 1986 Audio Interviews with actors Judith Anderson and Joan Fontaine, and the film's 1949 Re-release Trailer. A few items from both earlier discs have surprisingly not made the cut here (including a substantial promotional photo gallery, footage from the 1940 Oscars, a second piece on Daphne du Maurier, conversations between Hitchcock and Francois Truffaut, etc. ), but the addition of so many new and exclusive supplements easily makes this the film's most definitive package to date. 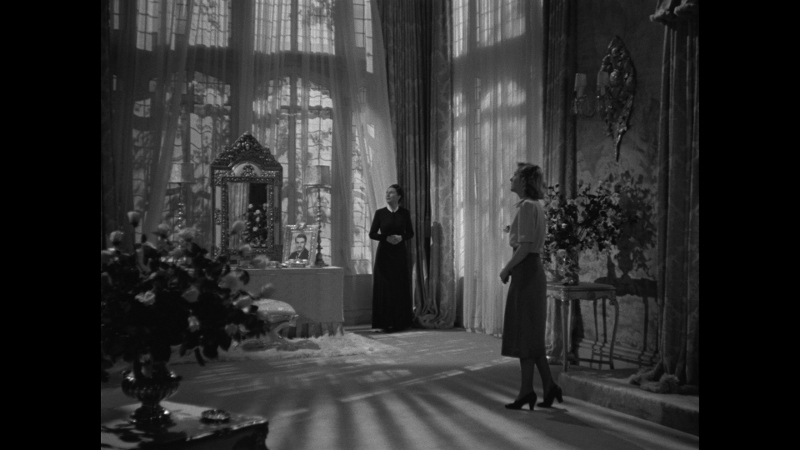 Alfred Hitchcock's Rebecca is one of the director's least recognizable productions: it's his first American film, adapted from the popular novel by Daphne du Maurier, and made under the strict supervision of producer David O. Selznick. Yet even without many of Hitch's signature stamps, it's undoubtedly a well-crafted film that holds up perfectly well more than 75 years later due to its excellent performances, formidable atmosphere, and clever visual effects (despite overstaying its welcome by a good 20 minutes, if I'm being perfectly honest). Criterion's outstanding new Blu-ray easily one-ups their own 2001 DVD and MGM's 2012 Blu-ray with a new 4K remaster, crisp audio, and a second disc overflowing with new and vintage bonus features. It's a knockout package for this somewhat underrated film, so I wouldn't blame die-hard fans and curious newcomers for picking up Rebecca immediately. Highly Recommended.